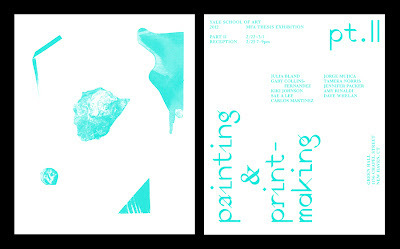 Make Do Gauche and Droite variants have been applied by Andrew Lister, to the print publicity for Yale School of Art's Painting and Printmaking MFA Thesis exhibitions. It's the first time Make Do has been licensed for use and good/odd to see it worked by another hand. The root motive was to design type with the same (mono)line character as my imagery—I'd understood it as drawing. The variants are incomplete and this motivates a working through of the full character sets, fit for purpose. I do like Andrew's use of studio detritus on the poster. Just back from New York City. A very good week, putting faces to names. Shooting a still-life today for Sight Unseen's upcoming book, after an interview with Jill Singer in NY. Drawing on Thursday—from Shirley Jackson's The Tooth (1949)—for Visualising Literature, a workshop as part of Into the Fold— Camberwell Press' two-week generative exhibition. Creating a three-colour print for Landfill Edition's Lots of Pictures; Lots of Fun editions, for Pick Me Up at Somerset House in March. More soon on all. Schematics for a twenty four hour television scheduling workshop. Make Do Type treatments for two samplers, to be used by Sally in her Idler Academy embroidery workshop this Friday evening at Selfridges. Part of their Words Words Words event. The texts both taken from Gaston Bachelard's seminal 'The Poetics of Space'. I'll be adding grids and solids, for demonstration of couching, shading and other fills but like them as artworks without any of that. We are working out a more developed, pre-printed embroidery kit with stitch instructions, for sale down the line.